THE red-and-yellow bus at Vasai Road station had only one door. A Koli woman and her three fish baskets were trying to get in through it. My spirits sank. Imagine starting off on a Sunday pilgrimage immersed in the smell of raw fish! The bus slowly filled up with other smells and sounds. A basketful of bananas, another of assorted greens and a jerry can of heavy-duty oil joined the fish. A hawker thrust a packet of pens under my nose. A packet of chana floated outside the window. Thankfully, the man in the next row had an English newspaper opened wide. The bus was old and rickety. Once we got into the countryside, its creeks and rattles seemed to bring the low clouds alive! The Konkan countryside turns a vivid green with the onset of monsoon. The hillsides present a blend of black igneous rock and green grasses or short trees. By the time the grey battlements of the Vajreshwari temple came into sight, we had spent over an hour on this green road. The Vajreshwari temple is a relic of Maratha glory. Chimaji Appa, the younger brother of Peshwa Bajirao I, got it built after the Marathas conquered the Bassein fort in 1739. 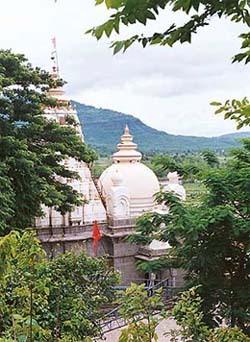 The temple stands atop a hillock by the road. A flight of 52 steps leads up to the main gate. Half way up, I stopped at the landing to survey the ground below. The Tansa, a small river, shone into view. It executes a crisp 'L' before slowly rolling into the cloud-draped hills. A large board in the main gate's side states the temple's history but it is in Marathi. Though the gate is clearly old, the covered walkway that connects it to the sanctum is not. The original temple must have stood in a walled courtyard, unconnected to the gate. It was a grey stone structure, probably dome roofed. But now the curves of domes are visible only from the inside. Both the sanctum and the forecourt have concave ceilings, capped by cement spires. The temple is dedicated to goddess Vajreshwari but the sanctum also has idols of goddess Renuka and goddess Kalika on either side of the main Vajreshwari idol. Smaller idols of Ganesha and other gods and goddesses are carved in the pillars and walls of the forecourt. Last year, scientists of the National Chemical Laboratory isolated a molecule that inhibits the AIDS causing HIV-1 protease, from a microbe that thrives in the high temperature and alkaline conditions of a hot spring in Vajreshwari. 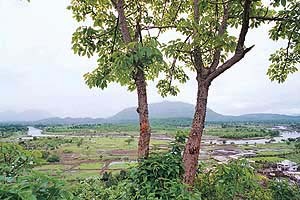 Vajreshwari lies in Thane district of Maharashtra, 31 km from Vasai Road station. The suburban train from Andheri in Mumbai takes 45 minutes to reach Vasai Road. The fare is Rs 8. The state transport bus from Vasai Road to Vajreshwari charges Rs 18. Travel time is one hour and 15 minutes. Both Renuka and Vajreshwari are widely revered in the North. The Renuka lake in Sirmour district of Himachal Pradesh is named after Renuka, mother of sage Parshurama, while Kangra and Chamba have famous Vajreshwari temples. The legend goes that Parshurama had performed a mahayajna at Vajreshwari and the hills of volcanic ash in the area are its residue. The Parshurama connection somewhat explains the worship of Renuka in the area but the Vajreshwari legend is quite complicated. In fact, there are differing beliefs about the goddess. 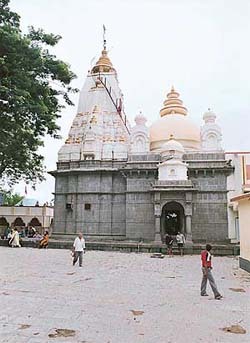 In Kangra, for instance, it is believed that the Vajreshwari temple marks the site where the left breast of Sati Parvati had fallen. But in Vasai, one belief is that the goddess came to be called Vajreshwari after she swallowed Indra's vajra (thunderbolt), which he had hurled at the sage Vashishtha. There is another belief that the goddess is called Vajreshwari because she entered Indra's Vajra to slay the demon Kalikat. Whatever the myth, the Vajreshwari shrine makes for a great outing due to its picturesque setting. On emerging from the temple, I walked down to Akloli village, about a kilometre ahead. The Tansa flows here but the village is better known for its 21 hot water springs. The presence of these springs is attributed to the volcanic past of the region. 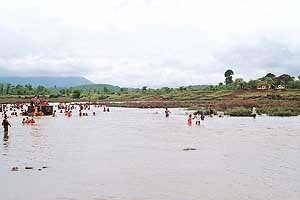 In all, there are about 350 hot springs in the Tejsa, Tansa and Surya rivers of Vasai taluka. Vajreshwari has a balmy air about it. Hardly a jarring shade in the miles of green... I crossed the bridge on the Tansa and walked down the rocks to the edge of the water. A farmer and his daughter were spending the Sunday afternoon fishing from a rock. I sat down to snap up their catch with my camera!